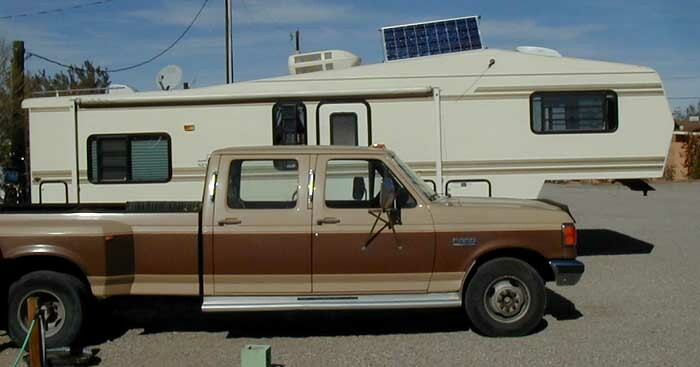 My rig with newly installed solar panel. Quartzsite is a strange place. It's a town of a few thousand permanent residents that swells to somewhere around one million people during the January - February peak season. And almost all of those visitors are RVers. The town is full of campgrounds, and is adjacent to the Bureau of Land Management (BLM) La Posa Long -Term Visitor Area (LTVA) where people can park their RVs out on the desert for extended stays. Many stay all winter, driving to town occasionally to fill up with water and groceries, and to dump their holding tanks. 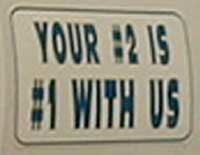 Quartzsite has a few permanent businesses in real buildings, but the vast majority are temporary, located in tents, motorhomes, and trailers. Items for sale include rocks and minerals, RV related equipment and services, crafts and collectibles, and just plain junk - a giant yard sale. I came here primarily to get a solar panel and a catalytic heater installed, but also to see one of the best known places on the RV circuit. I have spent my time walking around town, checking out the many vendors, and buying odds and ends. I visited a used bookstore and was browsing when the owner came over to put some books into the bin I was checking out. He wore a Santa Claus hat, and a sweater. As he stood in front of me I happened to glance down and discovered he was also wearing shoes and one of the best suntans I have ever seen but, as far as I could see, nothing else. A little more research determined that he was also wearing a black thong with a bright red pouch in the front. Pictures on the wall showed him poising with other (fully dressed) people, but wearing only brief underwear. It turned out that he is well known locally as Natural Paul. I got a 120 watt solar panel and charge controller installed. I have bought a 6000 BTU catalytic propane heater to be installed tomorrow. These two additions will dramatically increase the time I can spend away from a 110 volt electric line, making it possible for me to make extended visits to wilderness areas where hook-ups are not available. This is the memorial to Hi Jolly - the cultural highpoint of Quartzsite. According to a sign posted nearby, Secretary of War Jefferson Davis approved a plan to experiment with camels for carrying freight and messages in the desert southwest. In 1856 33 camels arrived in Texas with a caretaker whose Arabic name was Haiji Ali. The soldiers quickly nicknamed him "Hi Jolly" and the name stuck. The camel experiment was later abandoned and the camels were left on the Arizona Desert to shift for themselves. 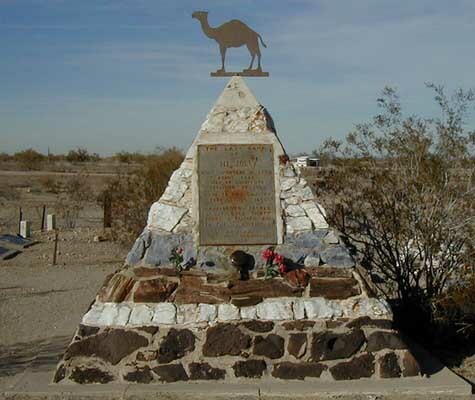 The monument marks the last camp of Hi Jolly who died in Quartzsite in 1902. 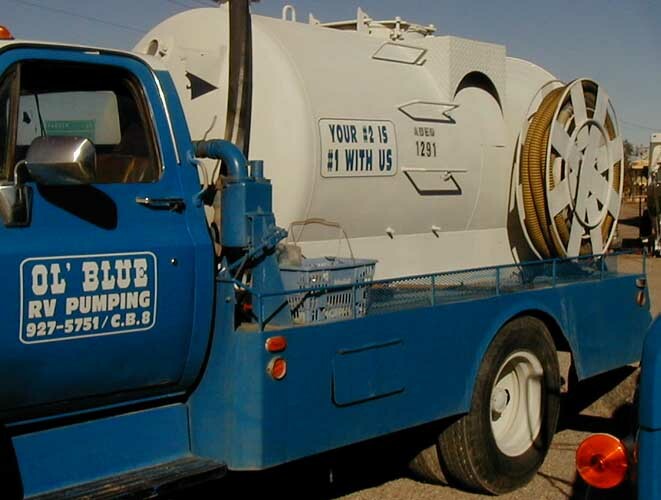 Sign on a Quartzsite septic pumping truck.